We humans would often prefer not to spend hours deliberating over simple choices, such as what to eat for breakfast or what show to watch in the evening. Neither do we often make choices in food or activity by random guessing. Instead, we typically tend to order food from a restaurant based on what we enjoyed eating there in the past, or we buy a certain brand of shoes, not because we carefully analyze the pros and cons of every option, but because we were satisfied with that same brand for our last pair of shoes. Generally speaking, humans and other animals tend to prefer items that have exhibited high value in the past, allowing them to minimize energy spent on decision-making while ensuring that the choices they do make are good ones. Okihide Hikosaka and his colleagues Masaharu Yasuda and Shinya Yamamoto investigated the role of certain structures of the basal ganglia in representing stable object values over the long term. Whereas many studies focus on how the basal ganglia can encode flexible, dynamic object values for a few items during working memory tasks, these researchers wanted to know how the brain might encode stable object values for many items over extended periods of time. The investigators trained rhesus monkeys on a visual saccade task, where a small fractal object would appear on a blank screen and the monkey would receive a juice reward for fixing his gaze on the object, a large reward for objects given high value and a small reward for those given a low value (see Figure 1). They recorded electrical activity from neurons in the substantia nigra pars reticulata (SNr), a region known to be important for reward prediction during learning, making sure that they projected to the ipsilateral superior colliculus (SC), a region known to help control visual saccades. Figure 1. Training Setup: Monkey must make a visual saccade toward a fractal object to receive a reward proportional to its assigned value. They trained the monkeys on this task for several months, then tested them after a number of days during which no further learning occurred. As one might expect, the monkeys would prefer to look at high-valued objects rather than low-valued ones, even without reward. In addition, the SNr neurons showed they could distinguish between high-value versus low-value objects during the neural tests. 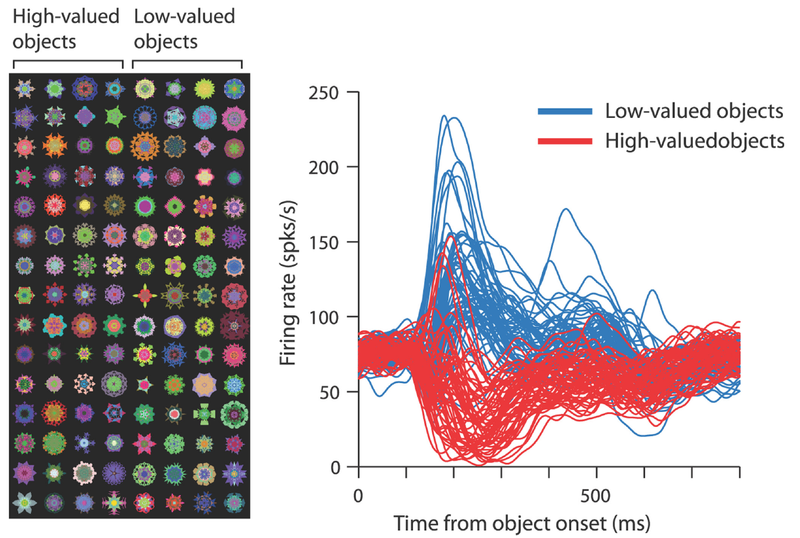 Neurons in the SNr consistently fired less high-value objects than for low-valued objects (see Figure 2). The projections from the SNr to the SC are inhibitory, so these neurons are inhibiting the SC from looking at low-value objects. Figure 2. Neural Responses: SNr neurons were excited for low-value objects and inhibited for high-value objects. Perhaps surprisingly, the researchers found that not only could the monkeys retain stable object values for a very large number of objects (each monkey was well-trained on over 280 unique fractal patterns), but these representations lasted for more than 100 days after learning had ceased. Monkeys, and by implication humans, would then seem to use the stable representations of object value from neurons of the SNr to make choices under normal conditions, while they can use the more flexible encoding in other working memory circuits when object values are rapidly changing. Dr. Okihide Hikosaka received his Ph.D. from the University of Tokyo in 1978. Over the next couple of decades, he served as a research professor at several institutions in Japan, including the Toho University School of Medicine, the National Institute of Physiological Sciences in Okazaki, and the Juntendo University School of Medicine. Since 2002, he has served as a Senior Researcher at the Laboratory of Sensorimotor Research, National Eye Institute. His research focuses on the neural mechanisms behind voluntary eye movements and motivated behavior. He will be giving a talk on Tuesday, February 12 at 4:00 pm in the CNCB about the role of basal ganglia in valuation, memory, and skill. Jonathan Garcia is a first year graduate student in the Neurosciences doctoral program at UCSD. His interests include systems and computational neuroscience. Clearly understandable and interesting, thank you.